Four robots have set out on an epic 33,000 nautical mile (66,000km) journey across the Pacific Ocean. Created by US firm Liquid Robotics, the four are aiming to set the record for the longest distance at sea travelled by an unmanned craft. Throughout their journey the robots will gather lots of data about the composition and quality of sea water. The journey is expected to take about 300 days, and is designed to inspire researchers to study ocean health. The robots were launched from the St Francis Yacht Club on the edge of San Francisco harbour on 17 November. Initially the four will travel as a flotilla to Hawaii and then will split into two pairs. One will go on to Australia and the other will head to Japan to support a dive on the Mariana Trench - the deepest part of the ocean. The robots manage to move thanks to interaction between the two halves of the autonomous vehicle. The upper half of the wave-riding robot is shaped like a stunted surfboard and it is attached by a cable to a lower part that sports a series of fins and a keel. Sensor readings Interaction between the two parts brought about by the motion of the waves enables the robot to propel itself. Electrical power for sensors is provided by solar panels on the upper surface of the robot. 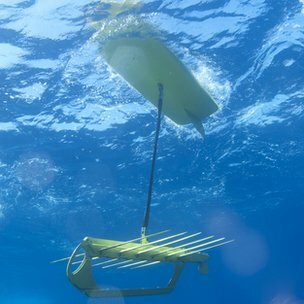 On their epic journey, the four robots will take sensor readings every 10 minutes to sample salinity, water temperature, weather, fluorescence, and dissolved oxygen. About 2.25 million data points will be gathered during the voyage and the wandering route they will take passes through regions never before surveyed. The data set will be fed back as it is gathered and then shared with anyone that registers their interest with Liquid Robotics. The company is also seeking innovative suggestions about what to do with the data being gathered. The winning entry in this competition will win six months of access to the wave-riding robots to complete the research. The wave-riding robots are veterans of ocean-going science and helped monitor the spread of oil during the Deepwater Horizon spill in the Gulf of Mexico. Before now the longest single journey they have undertaken was over a distance of 2,500 miles.